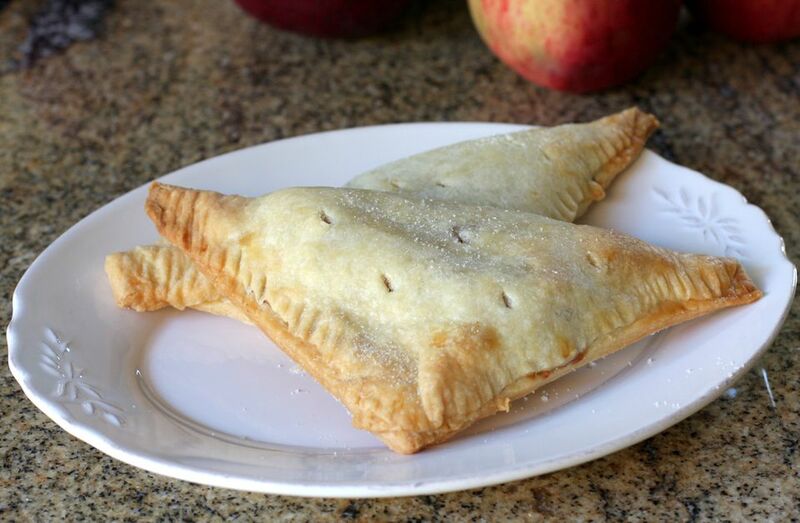 These turnovers are one of my favorite apple desserts, and they're sure to please the whole family. I made 5 large turnovers, but you could cut smaller squares and get 7 or 8 smaller turnovers. In a saucepan, mix together the brown sugar and cornstarch until blended. Add the apples, butter, and lemon juice. Stir in the cinnamon and nutmeg. Cook over medium heat, stirring, until apples are softened and mixture is thick, about 8 to 10 minutes. Refrigerate to chill thoroughly. In a food processor, mix the flour, salt, and 1 teaspoon sugar. Add the 6 tablespoons of cold butter and 2 tablespoons cold shortening and pulse until the mixture resembles coarse meal. You should still have some pieces of butter or shortening about the size of a small pea. Add 3 tablespoons ice cold water and mix until it begins to stick together. Add a little more, in very small amounts, if needed. Remove, shape into a disk, wrap in plastic wrap, and refrigerate for at least 30 minutes. Remove the dough and roll out to a sheet about 12 to 14 inches square. Cut into 4 5-inch squares and use scraps to make another square of circle for a 5th turnover. Put about 3 tablespoons of the chilled apple mixture on each square. Moisten the edges with a little water, fold over, and seal lightly with tines of a fork. Prick in a few places with a sharp knife or fork to allow steam to escape. Bake for 25 to 30 minutes, or until golden brown. Brush with a little milk and sprinkle with sugar the last 5 to 10 minutes.